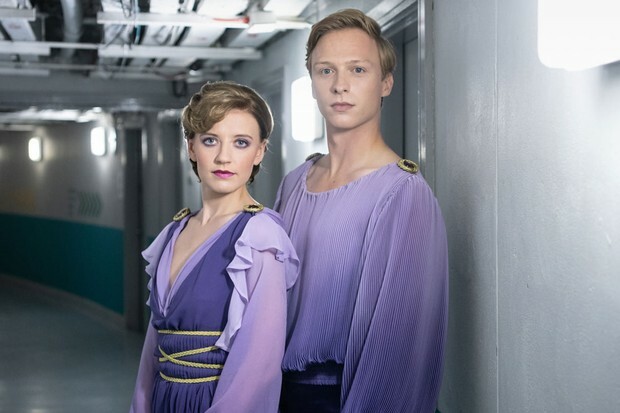 Ackley Birdge’s Poppy Lee Friar and Games of Thrones’ Will Tudor will play the legendary ice skating duo Jayne Torvill and Christopher Dean. Jayne Torvill and Christopher Dean went down in Olympic history with their record-breaking figure skating performance in 1984 – and now the Bolero legends are celebrated in a new drama from ITV. Written by Made in Dagenham screenwriter William Ivory,ITV’s feature-length biopic Torvill and Deantells the story of the skaters’ early partnership, and features a starry ensemble. The drama has secured the prime spot in ITV’s Christmas 2018 schedules, airing at 9pm on Christmas Day. What is on TV this Christmas? Here’s everything you need to know about the cast, including who is taking to the ice to play Torvill and Dean themselves. Ceramicist Claire, chef Charlton, blacksmith Katie and leatherworker Jason reveal what they learned when they went back in time to rediscover the skills of the past. In Made in Great Britain, Steph McGovern gathers together a band of modern-day crafts people, taking them back into the past to rediscover the manufacturing skills and methods that helped build a nation. A ceramic artist, a chef, an artist blacksmith and a leatherworker all try their hands at their own crafts, and those of their fellow makers, as they were practised in years gone by. 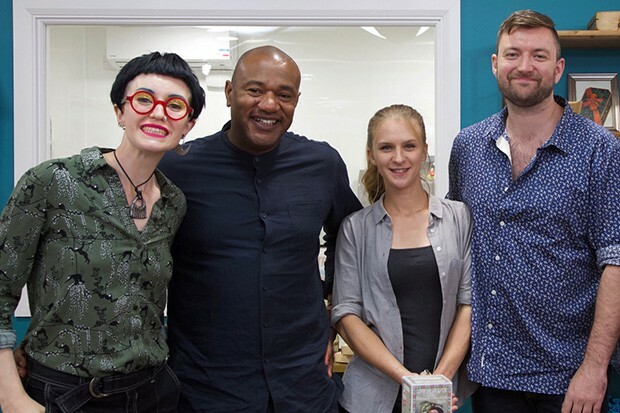 Below, Claire, Charlton, Katie and Jason tell us about their experiences on the show, their biggest challenges and what they learned about the history of their industries. Why did you want to take part in the series? I love history so wanted to help tell the stories behind every day objects, rooted in our heritage crafts. I hoped that meeting artisans who keep these industries alive today, may inspire a new generation of people to explore the joys of ‘making’ and to see the world around them in a new light. I also discovered through my grandmother that we had a long family history working in ceramics… and through taking part in this series, the BBC genealogists helped me discover just how long this history was! It was humbling to be able to trace our family back through the centuries, and to go back to where my family started this tradition. It has changed the way I view my family and my practice completely! What did you learn about the similarities and differences between what you do and how it was done in previous centuries? What really amazed me was realising that over hundreds of years, the fundamentals of ceramics have stayed relatively unchanged – you still need clay from the earth, your hands, and fire! In this century, however, with the inventions of machinery and movement, we are lucky to have options which make production easier, and we can choose our own balance – the best of all worlds! What did you find the biggest challenge of the series? I found it challenging to do a lot of the very physical work required to create things, like working metal for agricultural tools, or manipulating thick leather for shoes. Even digging up the earth for clay – I came home with muscles I never knew I had! The sheer physicality of these industries is astonishing, and makes me very focussed now on my own work! What was the most sobering thing you learnt about the conditions in your industry in the past? Conditions in the ceramics industry were extremely tough – smoke and dust particles meant very poor air quality, and combined with long working hours and hard repetitive activities, people often had terrible lung diseases, physical deformities and their jobs often shortened their lives. I feel incredibly grateful that their innovations, hard graft, and experimentation have enabled me to work much more safely in my own studio today. What most impressed you about what they were able to do? Across all the industries we have explored the most remarkable thing was the ingenuity, dedication, and skill people have applied to create beautiful functional objects which still stand the test of time. Despite the adverse and dangerous conditions they were working in, they managed to create such beauty, and left us with such an incredible legacy, and it is a legacy we are duty bound to protect and continue. 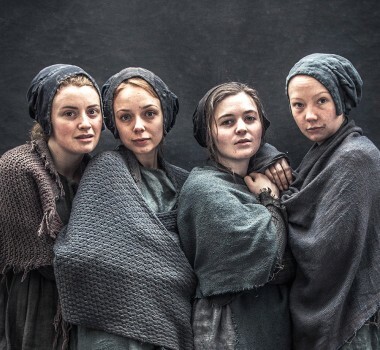 What’s the most important lesson you’ve learnt from your experiences on the show? Don’t take anything for granted – everything in our lives has been designed and created because of the ideas and revolutionary activities that came before us. When you walk in a good pair of shoes, you are walking in the shoes of your ancestors. We can all help carry on these incredible traditions and techniques. Arts and crafts is in all our heritage, so give it a try. It will change your life. Why did you want to take part in the series? It was a great opportunity to learn new skills, learn about how they impacted on our history and where those crafts are going. What did you learn about the similarities and differences between what you do and how it was done in previous centuries? I learned that trial and error are the backbone of creativity and progress, you must never be scared of failing, that’s how we learn and move forward. What did you find the biggest challenge of the series? Everything was really challenging, however I think the shoe making was the one that really made me realise that I’ve never thought about the hard work and difficult processes that go on to produce what we think is a simple shoe. What was the most sobering thing you learnt about the conditions in your industry in the past? I think all industries have a dark past that seem monstrous to us now in hindsight. The death rate in Sheffield during the Victorian era was absolutely mind boggling! All those people marching to the city for what they thought would be a better life and it was really a sort of death sentence. Awful. What most impressed you about what they were able to do? The discovery of and perfecting of rennet really blew my mind! So brilliant to see how people strove to make things last when there wasn’t the mad consumer society we live in now. What’s the most important lesson you’ve learnt from your experiences on the show? How lucky we are to be in our time and how we should learn from those people that got us here and adhere to their ideals of efficiency and making things that last. Why did you want to take part in the series? I have always loved exploring and trying my hand at other crafts, before I chose to pursue blacksmithing I wasn’t sure which craft I wanted to specialise in. Now that I have opened my own forge and workshop I have not had the time to try anything new outside of metal work. I wanted some time “to myself” as an artist maker to take my head out from its bubble of blacksmithing, to push myself out of my comfort zone and explore the unknown, and this series gave me the opportunity to try out a multitude of skills and learn techniques that I would otherwise have never been lucky enough to try. What did you learn about the similarities and differences between what you do and how it was done in previous centuries? The main difference I noticed was the working conditions and hours. Naturally, we found that as historical crafts people we were expected to work long, hard hours with poor working conditions, food and pay, all to produce products that we could likely never afford ourselves. As a modern day Blacksmith my role has changed, I work for myself and control my own working hours and conditions, and I know that that is something that I would not have been able to do in previous centuries and respect how lucky I am to be able to do what I do now. But I cannot as a crafts person ignore the beginnings of my industry and the difficulties that our ancestral makers had to face to give us the future we have now. In my industry (metal working) many of the traditional techniques and the basics of forge work are unchanged. I felt at home in the forge, having “the gist” of how to use the tools around me, but the main difference between using an old forge compared to my own was the use of the bellows. Using the bellows increased your physical input massively, even with a second person to give you a hand, there is not time to rest between “heats”, it certainly burnt a few extra calories! What did you find the biggest challenge of the series? The biggest challenge of the series was trying to train your hands to quickly pick up a physical skill that you have never experienced before. My hands do similar tasks every day and each one of the crafts that we experienced required you to use your hands in a completely different way, each was surprisingly difficult and we had a very short time to try each technique. Our lack of practice was very evident, but it showed how these skills cannot be mastered in an hour or a day, but took years of repetition and training. The series was also filmed in the middle of summer, when the heat was at its highest, everyone was suffering, benches spontaneously combusted and I have never sweated so much sitting down in my life! What was the most sobering thing you learnt about the conditions in your industry in the past? Food is important to me during a working day, if I am not well fed I cannot physically function or mentally concentrate, which can be very dangerous! In most of the situations we found ourselves in we realised that as workers you were expected to function on very little – I cannot imagine having to do what I do daily on the meagre meals they had access to. One moment that surprised, shocked and sobered me more than any was learning about the women in the steel factories during the war. I knew what an important part they played but I never considered to perils that they faced day to day. The steel factories were a target for attack, and an obvious one at that, as they could not turn off the furnaces during blackouts. The women could often not leave their “post” and needed to stay working in the factories whilst everyone else took cover. This was a sacrifice and risk that I had never considered and it filled me with pride and respect for the people involved. What most impressed you about what they were able to do? I was in a constant state of amazement and awe at the level of skill of the historical crafts makers. Considering many, if not most, in earlier centuries were illiterate they had an unbelievable understanding for their craft. I could not believe what children were expected to produce (especially in the industry of straw plaiting and hat making) and later what quantities and quality each worker was expected to achieve. What’s the most important thing you’ve learnt from your experiences on the show? The most striking thing I have taken away with me is a new found respect for all the crafts we took part in, not only for their difficulty but for their contribution to our country’s history. These crafts have built towns and cities and although they may be on the decline, if not almost lost completely, they will run through the fibre of the streets and buildings that still stand, and will hopefully never be fully forgotten. Why did you want to take part in the series? Taking part in the series was a great opportunity to understand and try my hand at other crafts. I have a huge appreciation of other makers and their talents so it’s been a real privilege to meet likeminded people and share our collective passion for our crafts. I also think it’s so important to celebrate the great industries that we were renowned for and the places and people that really made them. Unfortunately most of them don’t exist on the scale they once did, but I’m optimistic of the resurgence in craft and make, and new industries that may develop out of this. What did you learn about the similarities and differences between what you do and how it was done in previous centuries? Although I’m a leatherworker, shoemaking is new to me and very different from my own practice, in particular working with a last and forming over a solid object. I work in quite a different way when making leather accessories. There were some similarities in the tools – the awl was a key tool then and is now. The traditional hand stitching was similar – I only hand stitch in my own work, however I use a needle instead of a boar bristle! What did you find the biggest challenge of the series? I’d say adapting quickly to the new environments was quite a challenge. In my own making I value time and patience in the creation of my pieces. For the series we quickly had to grasp new techniques and then create an item. I think it’s also fair to say that the earlier environments were very challenging to work in. Quite dismal conditions, using rudimentary tools. What was the most sobering thing you learnt about the conditions in your industry in the past? One of the most sobering things I learnt generally was the amount of really hard and often very repetitive work that was needed, for seemingly very little reward. Particularly with piecemeal work. When the trade-off is whether you have worked hard enough to eat, it must have been pretty tough. What most impressed you about what they were able to do? I was continuously impressed by the rudimentary tools that were used to do the work, across all of the crafts. The skill involved must have been very high and the workers must have had a real dedication and strong work ethic to survive the conditions. What’s the most important thing you’ve learnt from your experiences on the show? I took away from the series the importance of continuing traditional methods but combining them with a modern approach and technology. Having a forward thinking approach is the only way traditional craft will survive. 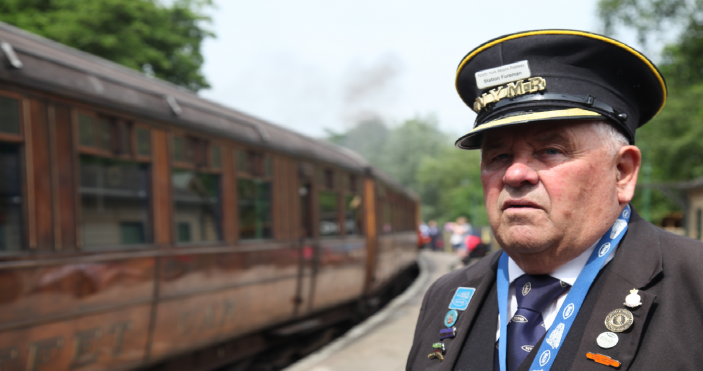 Channel 5 has ordered a bumper second series of DSP’s observational documentary The Yorkshire Steam Railway: All Aboard. The broadcaster has doubled the commission to 6 x 60-minute episodes after the three-part opening run reached 1.6m in March, well above the 1m slot average in its Friday 8pm slot. Copyright © 2013-2016 DSP, All rights reserved.